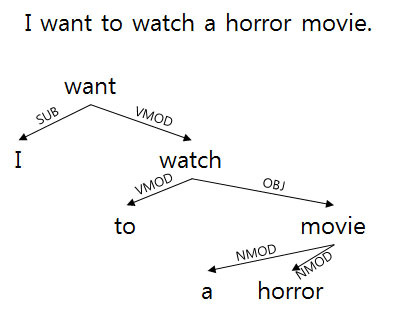 Parsing is an important step of natural language parsing, which analyze the structure of a sentence. Especially dependency parser finds dependency structure which consists of information that which token is dependent on another and the type of the dependency. The dependency structure is used for sentence analysis such as extracting main act and named entity, or subject-verb-object structure. Using machine learning, the dependency parser is trained by hand-parsed corpus. A dependency label shows the type of a dependency such as noun-modifier (NMOD) or object (OBJ). With various corpora of different languages, we can build . Generating new parser with new corpus should require a little effort such as defining a token, string management and finding a good feature set.